The Chicago papers continue the daily reporting of violence in the city and now the new President is adding his own ideas on the problem and solutions. 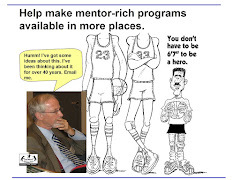 Mentoring and non-school youth serving programs have been offered as solutions, but too few are talking about the many years of support it takes to help a youth move from elementary school through high school and into a job and career out of poverty....and how long it takes to build a great, well-organized youth program. I've created dozens of graphics to illustrate ideas I share in this blog and on the Tutor/Mentor Institute,LLC web site. I'll show a few here. 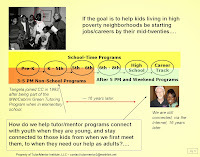 In the above graphic I show 7th and 8th grade teens who were part of the tutor/mentor program I formed in Chicago in 1993. At the right is a photo of one of those kids, who, after college, came back to talk at a year-end dinner. She and I and many of the other kids and volunteers are still connected on Facebook...nearly 20 years after we first met. That's what I mean by long-term tutor/mentor programs. 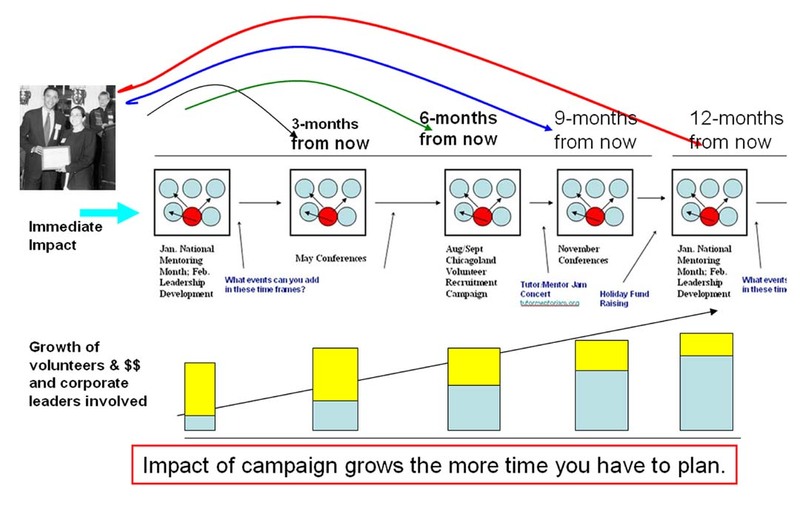 Below is another graphic, that focuses on the planning process needed to make programs like the one I was leading available in hundreds of locations. 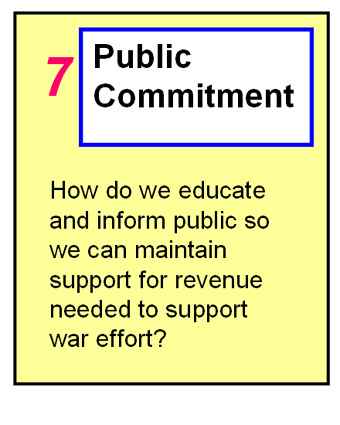 I compare this process to the planning generals do to win wars. 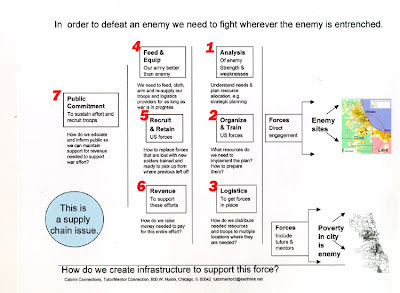 They use maps to show where the enemy is, then plan strategies that put our troops, with better weapons and training, and better support systems, in places where the enemy is concentrated. In this analogy, volunteer tutors/mentors and paid staff of non-school tutor/mentor programs are our 'troops". They need to be in every high poverty area of Chicago and its suburbs, and need to be well trained and supported. 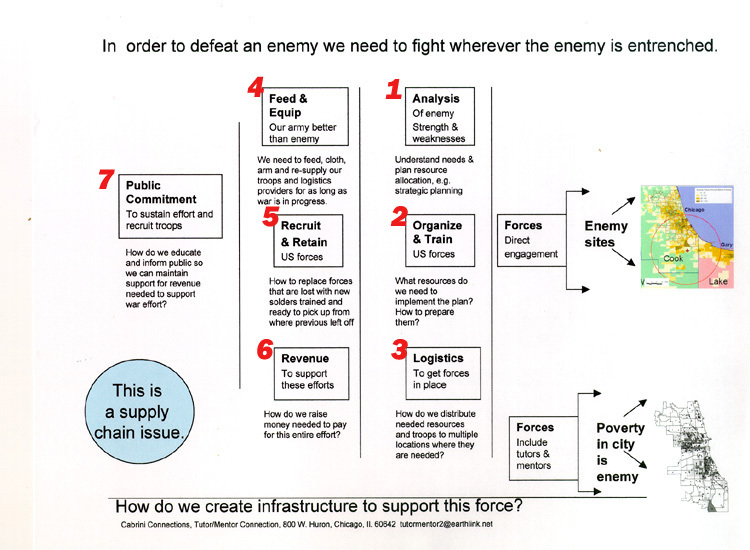 At the far left on the above graphic is STEP 7, which is the work needed to build and sustain public will, and consistent funding, to fight the war in every location where poverty, lack of jobs, lack of hope and opportunity, lead to violence against others and violence against self. 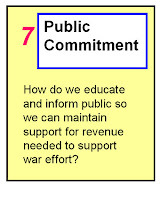 I encourage you to view a concept map with this graphic, and a presentation that explains the seven steps. Then look at this video, which was created by an intern from South Korea. Think of ways you, or your students, might communicate these ideas to your network. The next visual is one created while Barack Obama was President. 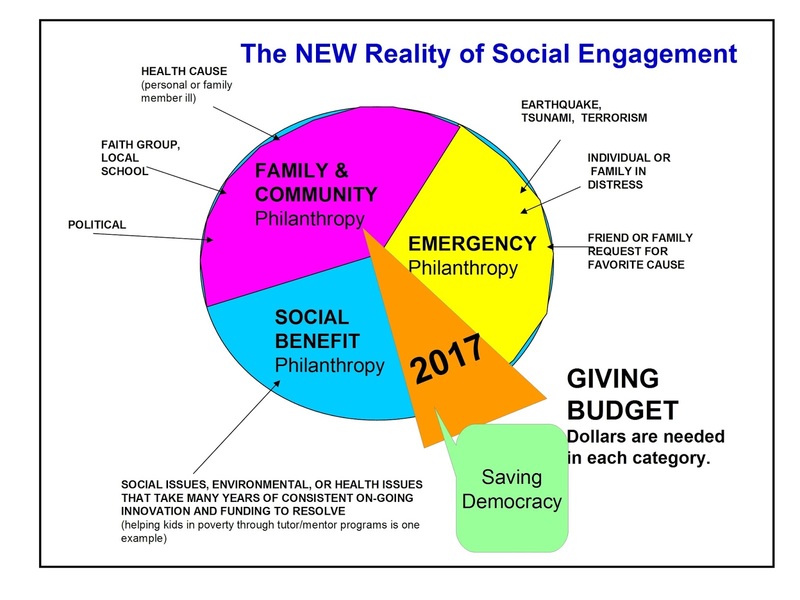 Building great tutor/mentor programs, and the public will needed to finance them and provide an on-going flow of volunteers, is a huge, and on-going challenge. 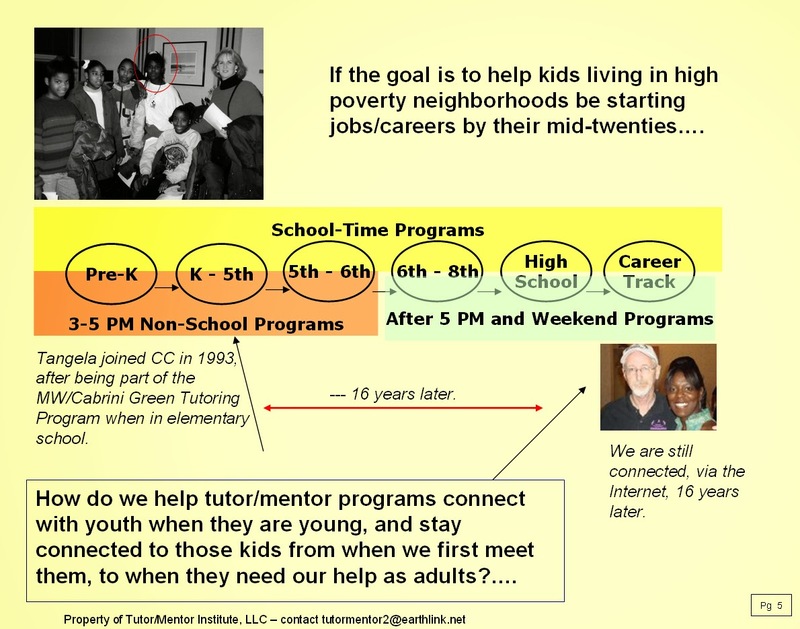 I launched the Tutor/Mentor Connection in 1993 with the goal of building greater visibility and a better flow of volunteers and operating dollars to tutor/mentor programs in all poverty areas of Chicago. Not having many dollars to advertise, the T/MC created quarterly events which drew programs together to learn from each other and created media attention at key times a year. 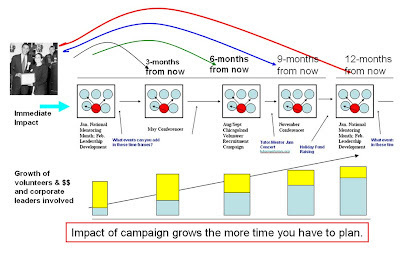 By repeating these events year-after-year the goal was to build a larger level of support. In 2010 two interns from South Korea, via IIT in Chicago, created Flash animations that showed the quarterly event calendar. In 2011 I created a video to record the animation. Recently I put this video in a Vialogue, where I could offer comment and update contact information. It's a place you can also view the video and start a discussion. These are another example of how students and volunteers can learn new skills, while communicating ideas that mobilize community support for tutor/mentor programs or other needed services. We're at a very difficult time in US and world history. 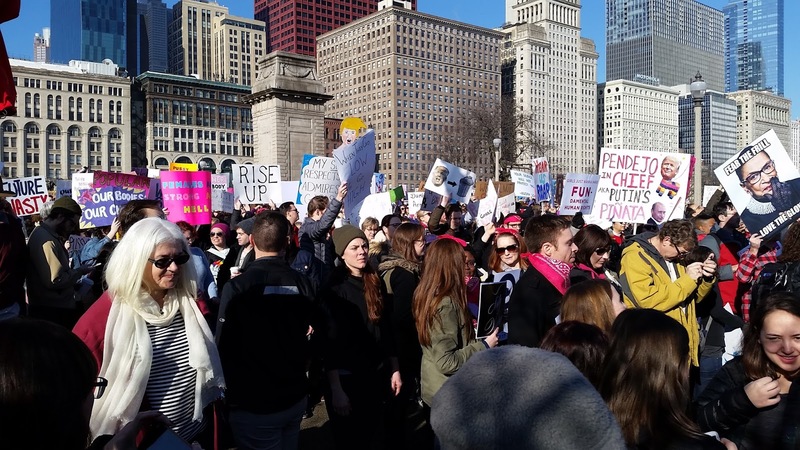 People are marching in the streets to protest a dramatically new form of political reality and there are many important issues that require attention, and public will. 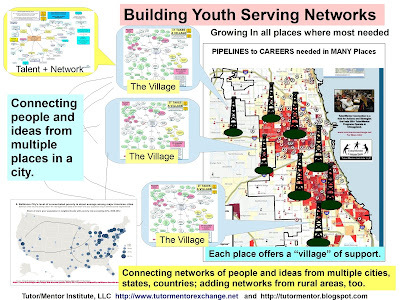 That's why I hope a few people will spend time reading this article, follow the links, and think of ways you and others can help build public will and support for needed, mentor-rich, non-school tutoring, mentoring and learning programs in high poverty areas of Chicago, other cities and rural America. At the same time, I hope that this planning process will be used in other sectors to mobilize talent and resources needed to find solutions to complex problems, and to find ways to make America a great place to live and raise families for people throughout this country and for those who see this country as a place of hope, opportunity, freedom of expression and freedom of religion.